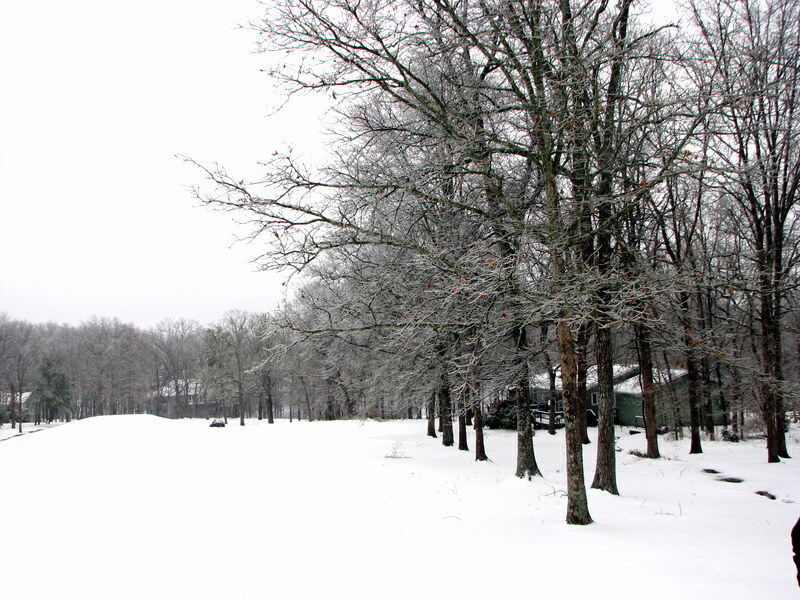 The golf course behind our house, Fairfield Glade, Tennessee. January 30, 2010. Since Friday afternoon we’ve had about 5 inches of snow, topped by up to an inch of ice, followed by more snow. It’s the biggest storm we’ve had in several years and one member of the family is definitely happy about it. The picture above was taken on the golf course fairway behind our house (we’re definitely going nowhere by car for a while!). Even I will admit that there is a stark beauty to the leafless trees. Betsy enjoying the snow in front of our house. January 30, 2010. 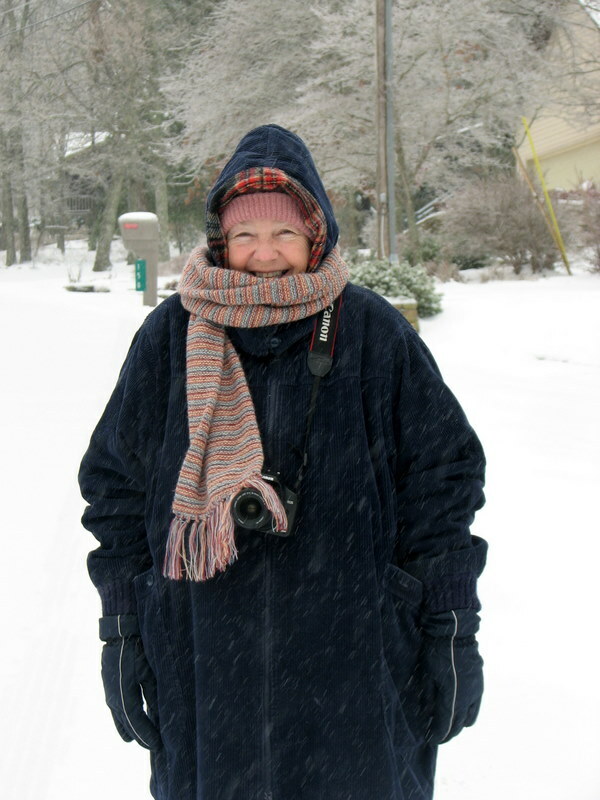 But the most scenic part of the day was the smile on my Beautiful Bride’s face as she ventured out to enjoy the snow. That smile is bright enough to lighten the whole day. I’m grateful for the opportunity to enjoy all kinds of weather with my beautiful bride. Our front yard in the early afternoon, Fairfield Glade. January 29, 2010. I can’t begin to tell you how happy my Beautiful Bride is this morning. She’s been waiting for almost four years for a day like this. She actually started smiling Friday afternoon. It began snowing late Friday morning and by early afternoon the street, driveway and yard were pretty much covered in white as you can see from the picture above. The wall in front of our house in the late afternoon. January 29, 2010. But much to Betsy’s delight, it just kept snowing. By late afternoon we had a couple of inches on the ground. 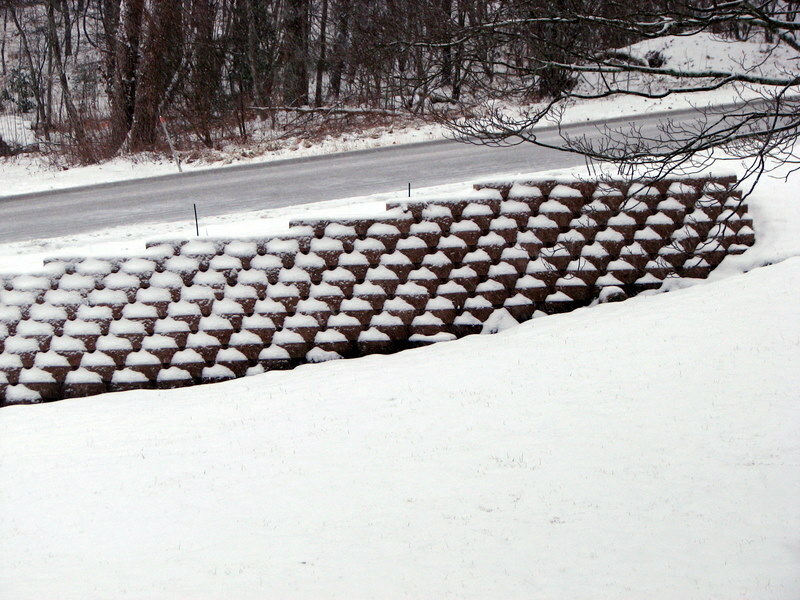 Even our newly repaired wall looked good in the snow. 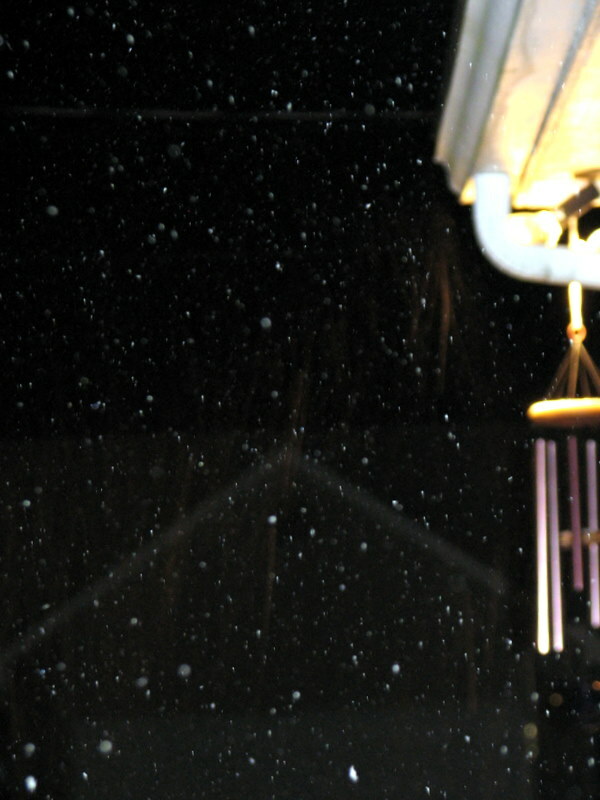 Still snowing after dark. January 29, 2010. Best of all it just kept snowing. This is what it looked like just before I began writing this post. I don’t know how much snow we will finally have — it’s supposed to keep snowing until noon Saturday. Some forecasts say we will have 7 to 9 inches by the time the storm ends. I predict Betsy will be absolutely giddy today! 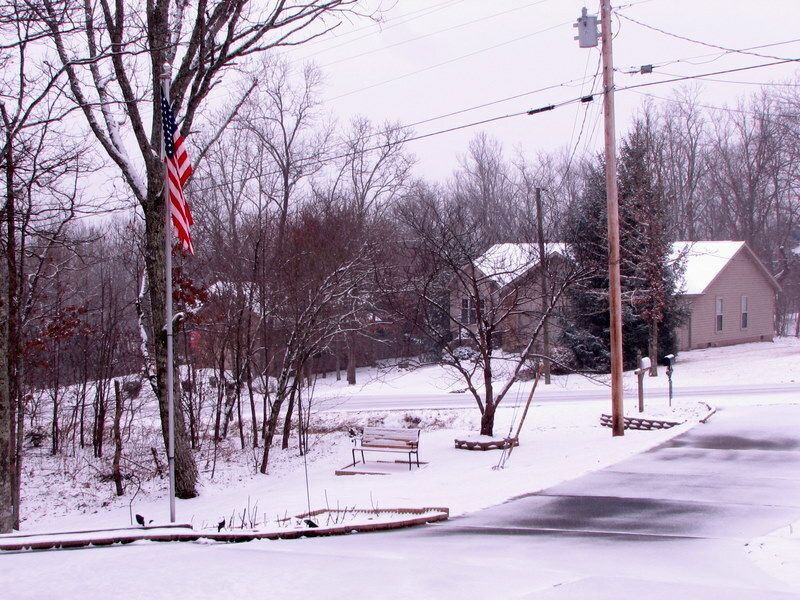 I’m grateful for the beauty of newly fallen snow and the way it makes the world seem new and clean. A winter moon over Fairfield Glade. We’re being threatened with a winter storm here in the Glade. The weather service says we could get several inches of snow with an inch or so of ice thrown in for good measure. Betsy would dearly love to see the snow, but she is not at all interested in the ice. To tell the truth, I don’t look forward to ice either. But all of this is in the future as I write this. Tonight (Thursday) the skies are clear and the moon is full. I hope the memory of this beautiful night will help me get through the next couple of days. I’m grateful that we can look up see beauty even in a dark sky. There really is water in this picture (the white streak on the right), so this qualifies for Watery Wednesday. 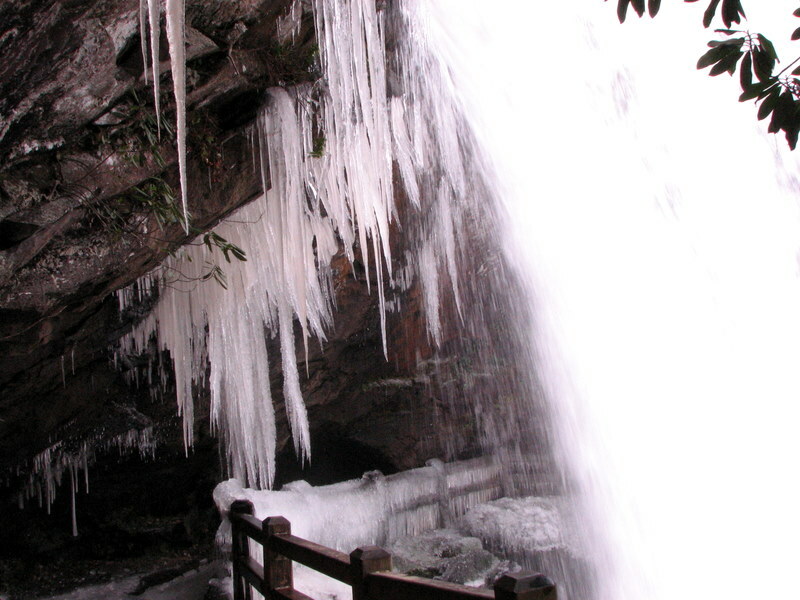 The picture was taken at Dry Falls in the Cullasaja Gorge west of Highlands, North Carolina. Dry Falls is a beautiful waterfall with a misleading name that Betsy and I have visited several times. Normally it is possible to walk behind the falls, but in December, 2009, when this picture was taken, the path was closed. All that ice made the path very treacherous. And all that ice should also dispel the idea that it doesn’t get cold in Dixie. I’m grateful for the beauty of all seasons. We’re being threatened with some nasty winter weather Thursday and Friday, so Betsy and I are going to Hendersonville today. We’re going to have a very full day helping my folks with some Medicare paperwork, so I’m not sure we’ll get back in time for me to post for Thursday morning. If not, I’ll be back Friday morning. We’re definitely in the middle of winter. We had snow flurries yesterday (Monday) and the weather service is threatening us with a winter storm later in the week. I know this should be expected in January, but I’ve had enough of Winter. I’m looking forward to Spring. Spring means that our roses will start showing signs of life. 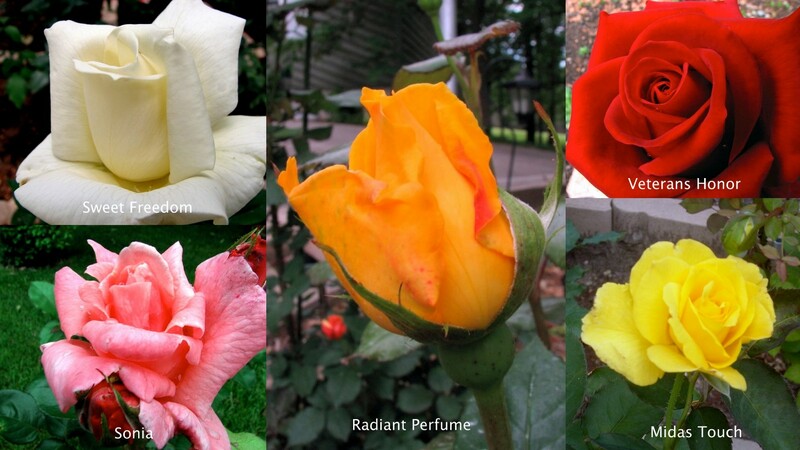 The collage above shows some of the roses we enjoyed in our yard in 2009. Scenes from our beach honeymoon. June, 2001. When Betsy and I got married in June, 2001, I still owned a house in Little River, South Carolina. I had lived in Little River when working in North Myrtle Beach, and I had not been able to sell it when I moved to Tennessee. Since Betsy likes the beach, we decided to spend the week after our wedding in Little River. 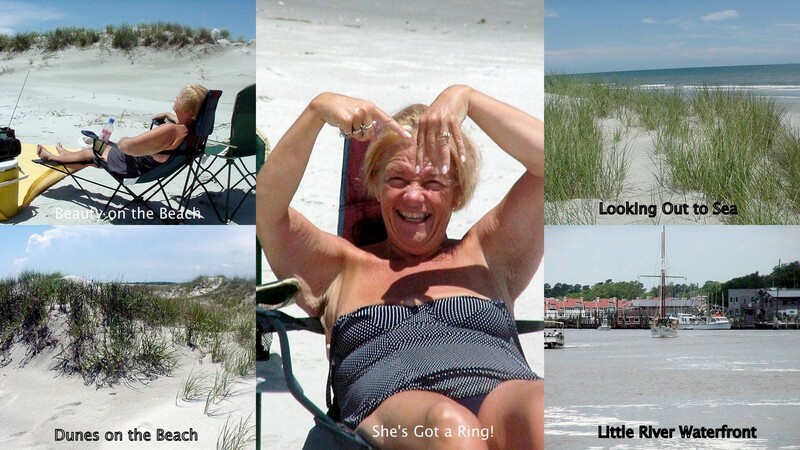 I had discovered a couple of beaches across the state line in North Carolina that I was eager to share with Betsy. We spent a couple of days at Sunset Beach, which turned out to be our favorite beach. Little River was a little fishing village on the Intracoastal Waterway. While fishing is still a big part of the local economy, there are other attractions for tourists as well. Casino boats dock in Little River and take people out beyond the three mile limit so they can legally gamble. We didn’t take a cruise on a casino boat, but we did take a cruise on a jet-powered boat, the Sea Screamer, out into the Atlantic and down the coast toward Myrtle Beach. It’s definitely not beach weather in Tennessee now, but I feel warmer just looking over these photos again. To see these pictures and others, click HERE. I’m grateful for each and every moment with my Beautiful Bride. I’ve been to St. Augustine, Florida, America’s oldest city, several times. There are many interesting things to see and do in St. Augustine, but one of the most fascinating places to visit is Castillo de San Marcos, the Spanish fort that was constructed to protect the town. Construction began in 1672 and Castillo de San Marcos in the oldest masonry fort in North America. It is also the only 17th century fort still standing. The fort was never captured in spite of several attacks from Spain’s enemies. 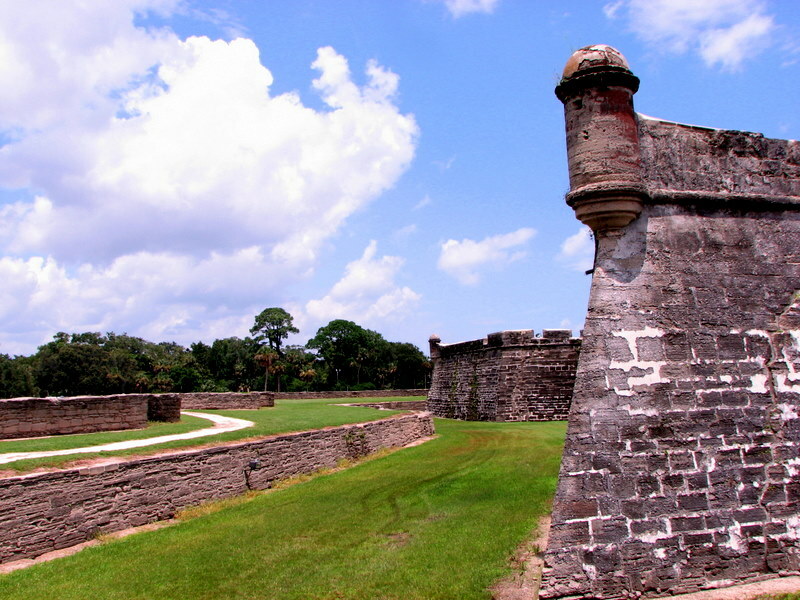 Castillo de San Marcos contains a great deal of history, but it is also a very scenic place to visit. I’m grateful for all the fascinating history of this country that has been preserved for us to enjoy today. 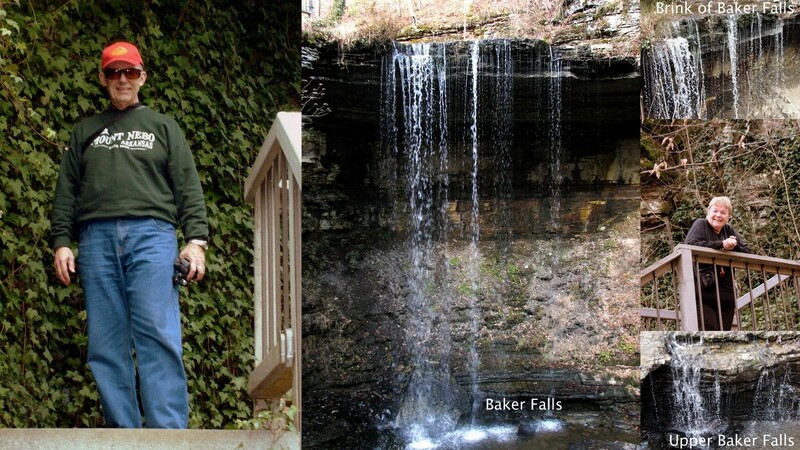 Baker Falls, Tullahoma, Tennessee. February 14, 2009. 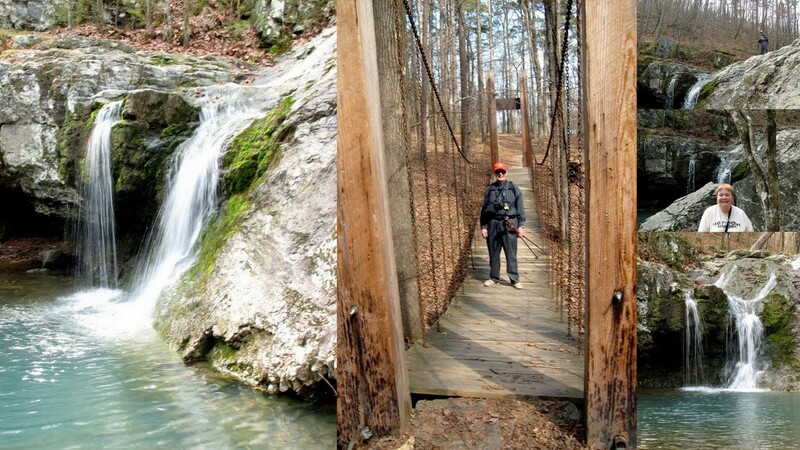 On Valentine Day last year Betsy and I did some hiking and waterfalling around Tullahoma, Tennessee. One of the waterfalls we visited was Baker Falls. In the Spring of 2009 this part of Tennessee was still recovering from drought. There wasn’t much water going over the falls, but Baker Falls, and a smaller waterfall above it, was still very beautiful. The nicest thing about this waterfall is that it is on private property, but the owners have granted permission for people to visit the falls. I’m grateful for the generosity of people who are willing to share the beauty of God’s world with others. 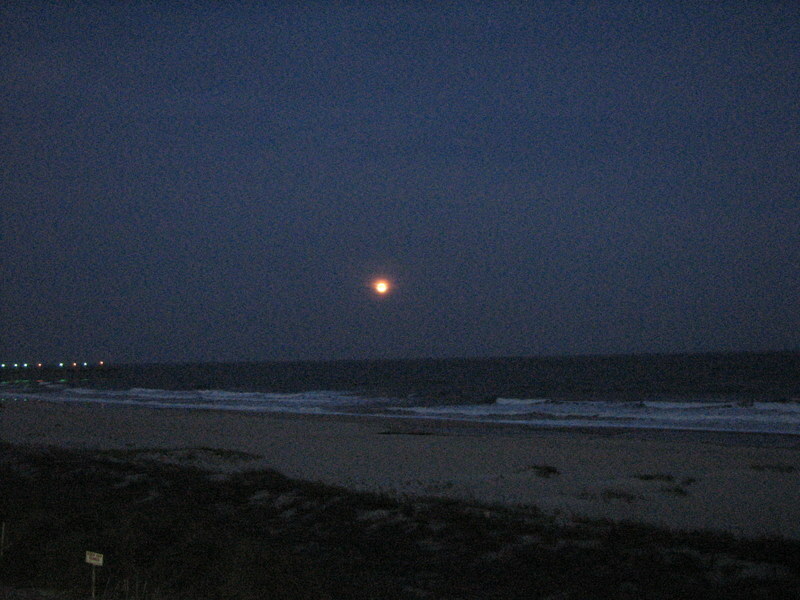 Moon rise off Ocean Isle Beach, North Carolina. May 8, 2009. Last May, while Betsy and I were at Ocean Isle Beach in North Carolina, we were treated to the moon rising over the ocean right across from our room. 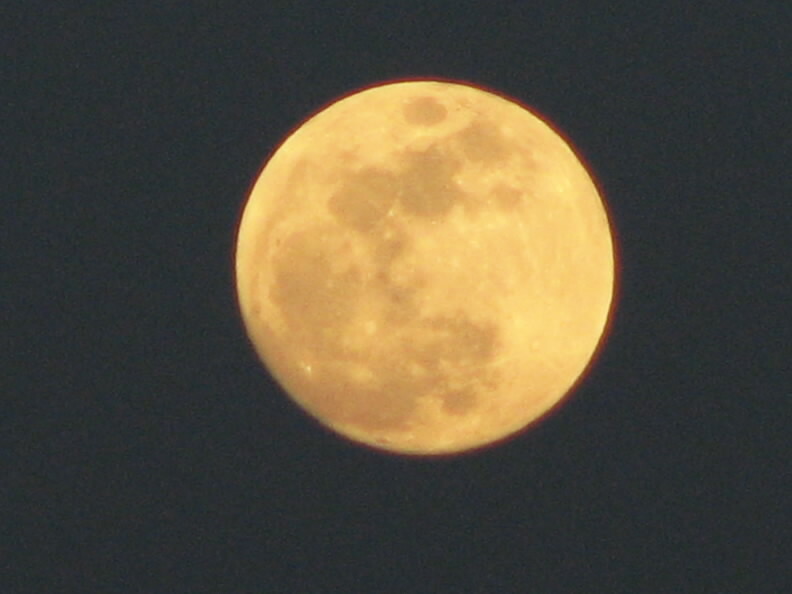 It was a beautiful sight that we enjoyed from our balcony for a couple of clear nights. I don’t have the best of cameras, but the picture above is a wonderful reminder of a special night at the beach. Scenes from Lake Catherine State Park, Arkansas. March 9, 2009. When we to Mount Nebo in Arkansas last March we took a side trip to visit Lake Catherine State Park near Hot Springs. Lake Catherine is a beautiful park with many facilities for recreation, but I’m sure you won’t be surprised to learn that what drew us to the park was a waterfall. Falls Creek Falls is one of the favorite falls used in advertisements for Arkansas State Parks. We didn’t find much water going over the falls, but the hike to the falls was very easy and pleasant. Part of the hike was through the woods to the lake and then along the shore to Falls Creek. We then hiked a short distance up the creek to the falls. All in all we had a couple of very pleasant hours at Lake Catherine State Park. We had a beautiful day, a nice hike, and of course we were able to add another waterfall to our collection. I’m grateful for all the people who work so hard to make our parks wonderful places to visit.